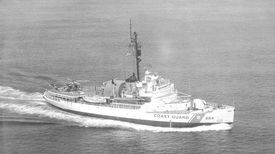 Type and Characteristics: Diesel-electric cutter, one of seven Wind-class, AG-89 (USN, 1947), AGB-2 (USN, 1949), WAGB-284 (USCG, 1965), built by Western Pipe & Steel Co., San Pedro, CA, laid down 15 May 1945, launched 29 May 1946, commissioned in USN 20 March 1947, in USCG 20 October 1965, 5,957 tons displacement full load, 269ft long x 63ft beam x 28ft 4in draft, 13kts, armed with 1-5in, helicopter flight deck, 205 crew - 14 officers, 2 warrant officers, 189 men. Additional for Polar operations - Scuba divers, medical officer, four pilots, 12 aviation ratings, scientists and observers. Log Period and Areas of Service: 1965-74, Greenland, Antarctica, Arctic, attempted North Polar circumnavigation. 20 March 1947 – The US Navy employed her as USS Edisto in Greenland, Iceland and Canadian Arctic waters in northern winter months, and in the Antarctic in southern winter months for the next 18 years. 20 October 1965 – Became USCGC Edisto (WAGB-284) when decommissioned by the Navy, transferred, and immediately commissioned by the Coast Guard. November 1965 – Sailed for Thule, Greenland. December 1965 – At Bethlehem Steel Shipyard for repairs and alterations; given a flight deck with a telescopic hangar to house two helicopters. 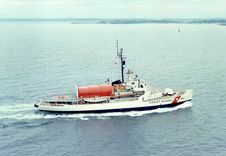 Summers 1966 to 1971 – Deployed to Arctic waters off Greenland and Iceland for "Arctic East" operations. 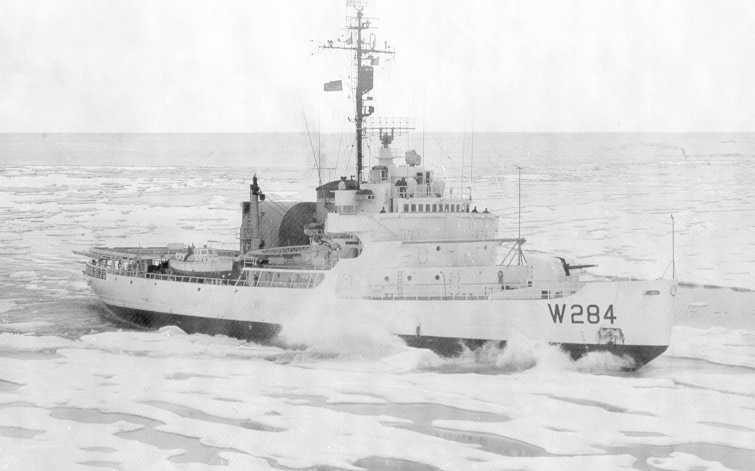 Winter 1966 – Deployed to northern Baffin Bay to repair undersea cable. 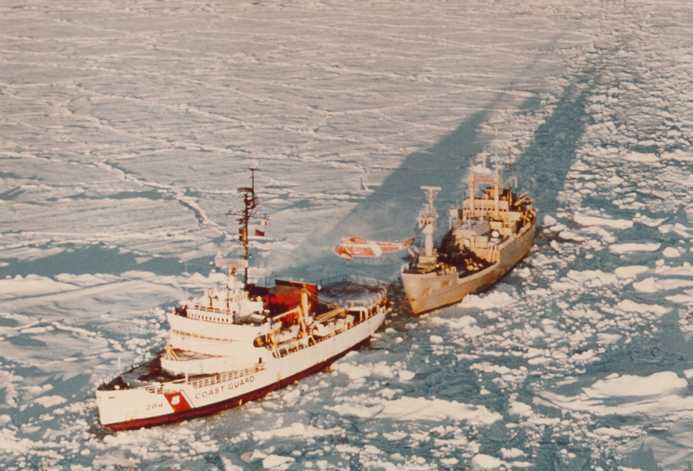 1967 – In company with USCGC Eastwind, made an unsuccessful attempt to circumnavigate the Arctic. Winters 1968 and 1969 – Antarctic deployments for operations DEEPFREEZE 69 and DEEPFREEZE 70. December 1971 – Transferred to Milwaukee and the Great Lakes. 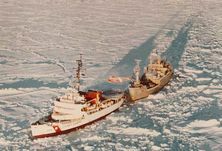 1972 – After repairs following a collision, homeported at Baltimore as icebreaker. 7 July 1974 – Sailed on three-phase "Arctic East" voyage to Greenland, the Icelandic Sea and the Labrador Sea. Fate: Decommissioned at Baltimore on 15 November 1974 and then transferred to the General Service Administration (GSA). 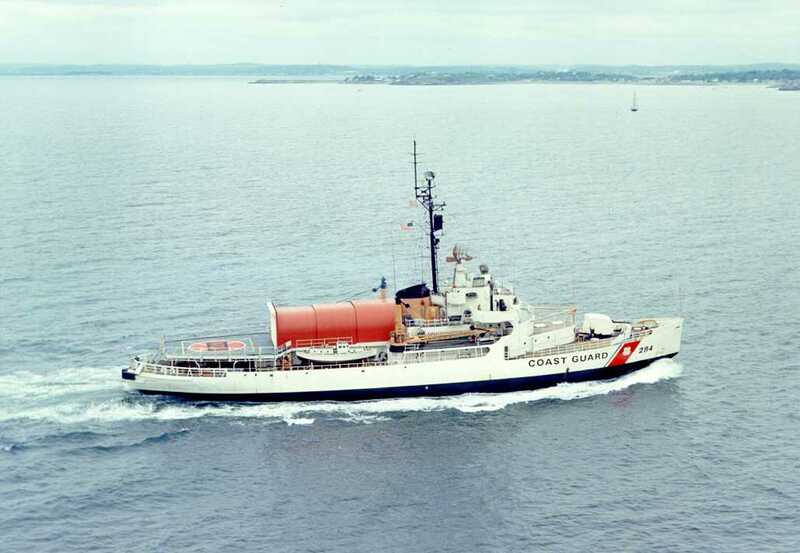 GSA sold her on 29 September 1977 to Boston Metals Company of Baltimore which then sold her to the Union Minerals Company of Carey, New Jersey. They dismantled her for scrap in the Baltimore Shipyard.